Home / Gadgets / Rotimatic / Rotimatic - World's first fully automatic Roti making appliance. 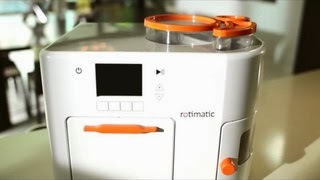 Rotimatic - World's first fully automatic Roti making appliance. Rotimatic is world's first fully automatic roti making appliance. For centuries women have spent time daily to make fresh rotis for their families, a task which is often described as a chore and a hassle. Rotimatic solves this problem and frees up people from the daily chore. Now healthy homemade fresh rotis are available at a touch of a button.